If I shouted for you now, you would die. As would your wife, and anyone else around here. I really ought to check out more Jerry Solimowski films. The only other film by him I'm really familiar with is The Adventures of Gerard, which is a favourite. 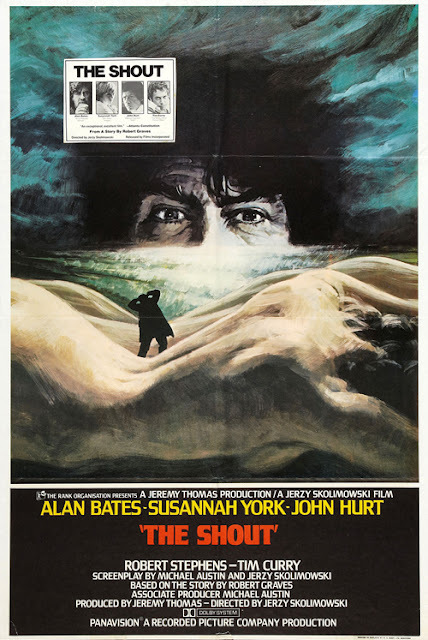 This is in the tradition of other semi-supernatural films of the '70s such as Don't Look Now (and Roeg was originally offered the director’s seat here), and adapted from a Robert Graves short story. We see unreliable narrator Alan Bates tell a story at a cricket match of how he was taught a shout that can kill. John Hurt and the ever delectable Susannah York are the couple he comes between in his tale. Inicdents of expertly fractured sound and narrative run through the film, and that kind of peculiar but insightful view of England that comes from a non-local eye.